Ana and I signed up for a youth camp of some kind. The weeklong camp wasn't what I expected. The age group is teens. I'm old enough to be a volunteer. During a service gathering Ana tries to kiss and make out with me in the seats. I feel like we're being inappropriate. I scold her in harsh whispers, "Ana! We're in church. We can't do this right now. Later." I know some of the counselors already saw us and of course the teens behind us witnessed it. We move on. Later everybody's migrating to the tabernacle, which is about a mile trek there. I remember this campground from when I was a kid. Every summer I used to come here to Roanoke, Virginia. I know it like the back of my hand. But I start to see some new structures. Down by the hill is a duplex trailer I don't remember seeing before where some crazy ladies live. We pass through an open corridor with interesting artifacts from historical Roanoke. One of them is this antique concertina piano built in the early 1800's. Somehow an electric on/off switch was installed onto it. Ana walks right underneath it with intent on playing it. Obviously it's not permitted to touch it. I scold her again. She flips the switch on anyway and starts banging on the keys. I look at all the elders and random people walking by feeling embarrassed. Waking up around 1:45 p.m.
After telling her about the comical dream I had with her Ana says that her arm was around me a lot throughout the night so that could explain her presence in my dreams. Sharing bowls of cereal: Honey Bunches of Oats with Milk. While I tend to photo notifications from Show N Tell, Ana combs her long flowing black hair. She jokes, "I'm gonna put it all in the trash can so you don't have to vacuum." This is a reference to me discovering her strands of hair that get entangled in my toes when walking around. She's a shedder...like a cat. Little do we know we've got a big day ahead of us. Thrift Store browsing. Getting groceries at Trader Joe's. At Payless she buys a new pair of black shoes that originally had a price tag of $14.99 but after ringing it up at the register we find out the price went up three dollars. Paying more at Payless seems trite. Back home. I crank up the 90's dance music in the living room and we dance, exercise, and move our bodies about in a careless excited attitude. Laron sits off to the side on his computer unaffected. Sharing lunch: Egg Wrap with Vegenaise. A hefty Salad with Edamame and Chic Peas. Spending a good portion of the evening adjusting things on her new Lotus bicycle. We just pumped air into the tires of both our bikes. As we're walking out the door we hear a PSSSSS sound. Her back tire goes flat. We run to Bike Beat to see if they have a replacement tube but to no avail they don't. It will have to be special ordered. So we settle for a patch-up kit for now. I locate the hole and fiddle with the glue and patch. But it doesn't do the job. Even though I wasn't able to solve the problem today in the end I learned a lot about bicycles. We head to the basketball courts. Ana's shown an interest in playing lately. There's already a group of guys knee deep in a game in the court next to us. They lose a few players and I ask to join. Immediately I score two brisk shots. Throughout the game I'm starting to get recognized for my quickness. I didn't even realize I had this flash ability. I guess it just comes with practice. My team doesn't win though. Final score: 12-9. But it's not about winning; it's about the love of the game. Talking with Ana in the car: "That's what I love about basketball. It's so universal. I might never see those guys again." More physical activities planned. It's Rec Day I suppose. Meeting up at Elliott's with him and Taylor. Elliott lets Ana borrow a beach cruiser so we can ride the strip/boardwalk. We bring along a kickball and chalk. Setting up a Four Square game on 16th Street. Every now and then strangers pass by to join the ongoing game. Fun. Fun. Fun. I (we) missed dinner earlier so my body is craving something, anything. Ana and I depart from the beach in hopes to find peace and rest at the house. That's not exactly what we find, as there happens to be some kind of small gathering, nothing out of the norm. I scramble ingredients for dinner. Ana helps me cut the vegetables, her favorite pastime. After realizing the big range I'm cooking on isn't heating up like it's supposed to (as we usually have a problem with) it kind of sets me off on this little rant about how all these little nuisances add up and cause stress in my life. I use heat pads in attempt to wiggle the connection to the stove. I complain to Ana, "Man! My life is just tweaking, always tweaking!" And it really is sometimes. She listens supportively. Eventually, dinner is done and we enjoy Brown Rice Spaghetti with Garlic Tomato Sauce, Onions, and Green Peppers. Decompressing in my room. I can hear the faint (or rather blatant) sounds of Anthony, Josh, Richie, Mike Fry, and whomever hooting and hollering like a bunch of monkeys. I try to push it out of mind. Gathering my thoughts and playing a few rounds of Unreal Tournament. Around 5 a.m. I slip into the bed next to Ana. She immediately clamors onto me with a loving warmth that can't be described, caressing my bare back and kissing my neck. I'm grateful. [i] Thrift store find. Image by me. 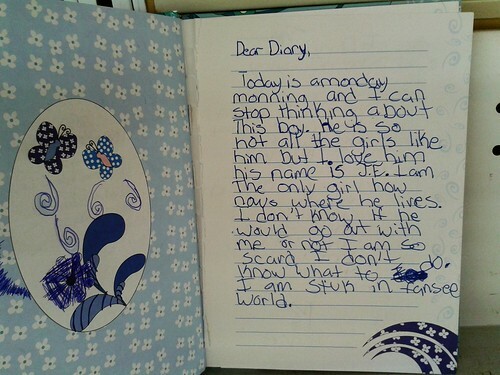 Diary entry by unknown girl.